For this two weeks workshop, Zambrano returns to his life experience of salsa dancing. He recalls the beauty in the conversations of hands, the exchanging of rhythmical steps, big band music and the passion for dancing with another person. 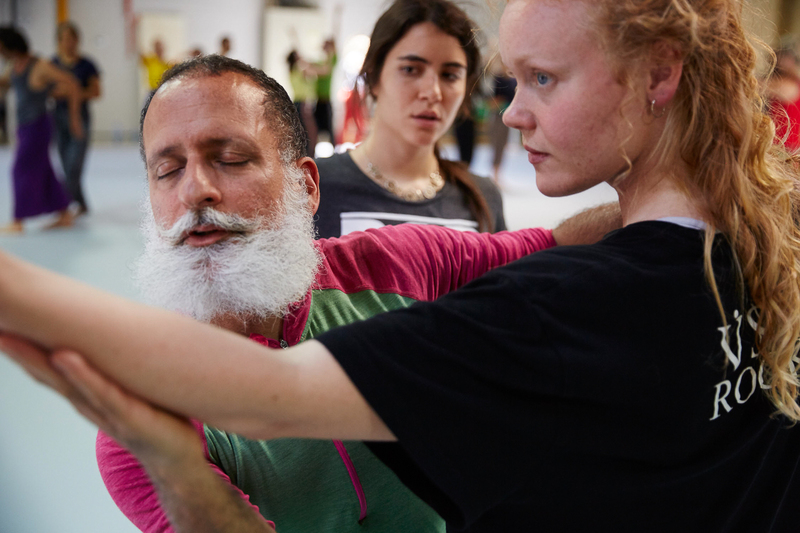 He takes this history of partner dancing and redefine it as something that could be more appropriate for the modern era, following the influence of contact improvisation, shifting gender and sexual roles and focusing on broader rights for all races. Leading and following can be taken by either both and shared. Rolls are not divided over gender or sexual preferences. The verticality and uprightness is broken down, so also dancers can go to different levels and move over the floor with different body parts. But from the experience of the history of couple dancing is kept the structure that at all times there is kept a direct hand-touch, but they can shift according to the need and choices made by the dancers. The workshops by David Zambrano are mostly attended by professional dancers and choreographers worldwide, who want to be challenged in finding more possibilities in working physically as dance-artists. This publication is addressed to them. This workshop will be assisted by Milan Herich.